I’ve always been allergic to diets. Never tried them. I don’t like it when others tell me what NOT to eat (and why is that ALWAYS sugar? Can’t someone come up with a diet without broccoli and garlic for once?). Nope, this Italian has always eaten the Mediterranean way. Plenty of fruits and veggies, some meat and fish, lots of whole grains (pizza!) and a little (too much) sugar (girl has a sweet tooth 😉 ). Until I came across “Future Proof Your Skin: Slow Down Your Biological Clock By Changing The Way You Eat” by Dr Stefanie Williams from Eudelo (damn my book addiction!). In the book, Dr Stefanie shares exactly what to eat for perfect skin (check out my interview where she dishes out the short version). She recommends a low glycemic diet. No sugar. Few carbs. Plenty of fat. Kinda the opposite of what we’ve been told so far it’s good for us. For the past few months, I’ve put it to the test. It was hard (girl loves sugar). But, boy, was it worth it! I don’t get the odd pimple anymore. No, not even during that time of the month. My skin looks brighter. Words has it, the diet keeps fine lines and wrinkles at bay for a long, long time too. What The Heck Is The Low Glycemic Diet? A low glycemic diet is an eating plan based on how each food affects your blood sugar level (glycemic means blood sugar or glucose). Each food is given a glycemic index (GI) number that can be compared to pure glucose (GI 100). The closer the number is to 100, the higher its GI. The closest to zero, the lower its GI. You want to stick to foods with a lower GI. What’s The Deal With High GI Foods? I’m gonna get a little sciencey on you here. I’ll keep it simple, I promise. There are three types of carbohydrates: sugars, starches and fibers. Fibers get through your body undigested, whether sugars and starches are turned into glucose. Glucose is your body’s main source of energy. It’s the fuel your brain uses to operate. When it has too much (and it ALWAYS has too much on the typical Western diet), the excess is stored in fat cells. It doesn’t matter if you get your carb fix from a pizza, a cup of blueberries or jacket potatoes. Whenever you eat carbs, your insulin level spikes up. How fast this happens depends on the type of carbs you eat. That cup of blueberries will cause a very slow rise, while your soda drink makes your blood sugar and insulin levels spike super quickly. This is bad for you: high insulin levels are associated with diabetes, heart disease, hypertension and obesity. And this is just for your health. Too much glucose wreaks havoc on your skin, too. PS. To add insult to injury, glucose isn’t even a reliable form of energy! That delicious pancakes breakfast doesn’t even keep you full for long! A couple of hours later, you get brain fog, horrible hunger pains and feel so sluggish and tired. You eat more sugar to keep your energy levels up. Now, you’re stuck in a vicious circle when you have to feed your body sugar all the time! Wrinkles: ever wondered why people affected by diabetes look older? Glycation. That’s a fancy way of saying that sugar hardens and cross-links collagen and elastin, the proteins that keep your skin firm and elastic. When they’re damaged, skin sags and wrinkles appear. Pimples: high levels of insulin trigger the skin to produce way more sebum that it needs. Hello, pimples! Inflammation: too much sugar causes inflammation, which leads to wrinkles, dark spots and irritations. Who knew a cookie could do all this, huh? How Do You Follow The Low Glycemic Diet? Throw your scale away! There’s no need to count carbs and all that nonsense. (Seriously, if a diet asks me that, I’m not gonna follow it. Too. Much. Work). There’s only one rule: eat more foods with a low GI and fewer foods with a high GI. Simple, huh? Click here for a more comprehensive list of foods and their GI. The way you cook and prepare your food can raise its GI! For example, oatmeal has a GI of 55 while instant oatmeal 79! A raw orange has a GI of 45 while unsweetened orange juice 50 (it goes up if you add sugar). Even raw carrots or onions have a higher GI if you cook them before you eat them! Good news: just because a food is on the high GI list, it doesn’t mean it’s banned. It will all make sense as soon as I introduce you to glycemic load, the last piece of the puzzle. Glycemic index measures how a food affects your blood sugar level. Glycemic index takes into account how a food affects you blood sugar level when eaten in average portions (rather than only in 100g servings). A lot of the veggies that are high on the GI index score lower on the glycemic load scale. For example, boiled white potatoes have a GI of 81 but score only 21 on the glycemic load scale. In other words: it’s all about moderation. You can enjoy a small portions of “bad” foods as part of a meal high in low GI foods. Just don’t make them the bulk of your diet. Eat less processeds foods: as a rule, raw foods have a lower GI than foods that have been cooked or processed. The more refined a food is, the quicker it will make your sugar level spike. Combine carbs with fats and proteins: pairing low GI foods with proteins and healthy fats (ie avocado or salmon) helps manage your blood sugar levels, reduces hunger and increases energy. Try to include all three food groups in every meal. Eat more fiber: fiber slows down digestion, prevents the rapid absorption of sugar and starch and helps you stabilize blood sugar levels. As a rule, the more processed a food is, the less fiber it has. The foods highest in fibers are green leafy vegetables, avocado, chia and flax seeds and cruciferous vegetables. Skincare helps, but it’s not a miracle worker. If you don’t address the root cause of your problems, you’ll never get rid of your acne, heal your dry skin or reduce inflammation. A diet rich in fried, processed food and sugar will give you all that and then some. 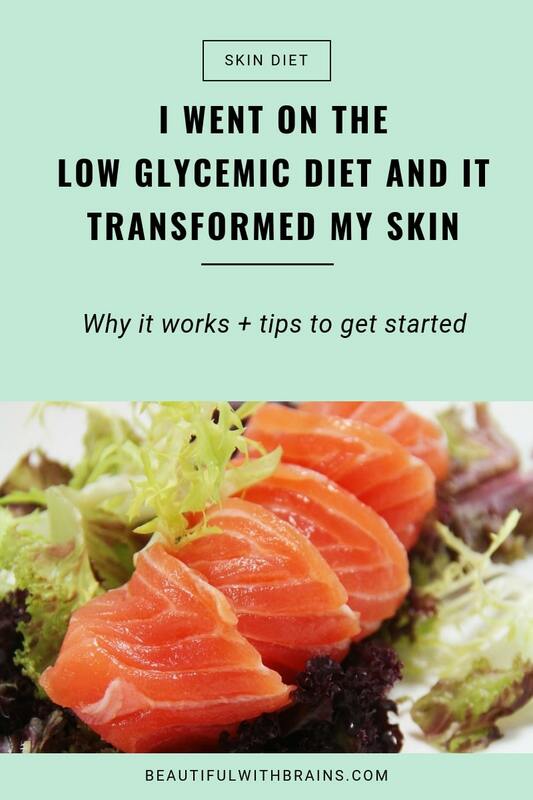 The low glycemic diet will fix it all, give you great skin, banish zits and amp up your energy. Try it to believe it. Have you tried the low glycemic diet? Share your experience in the comments below. Can A Probiotic Supplement Treat Acne? SPF 15 Sunscreen + Tan Intensifying After Sun: Can They Keep Your Skin (And Tan) Safe In This Heat? Thanks for writing about this!!! It´s an interesting diet. I haven´t actively tried it, but I tend to eat more low GI foods. Except for banana!!!! I have type 2 diabetes so I have no choice but to go on a lower carb diet. I personally don’t count carbs but self testing my blood glucose has made it easier for me to know which carbs to avoid. The typical things I avoid big time are those made with sugar, honey, maple syrup and other sweeteners with high carb content, and those made with wheat, rice, buckwheat flour (again, high carb). In addition to managing my blood sugar, the bonuses of eating lower carbs were/are weight loss, clear face, less dry skin (face and body), healthier teeth, more energy and not being hungry all the time. Getting clear face and better skin was the big surprise to me. Another bonus was learning to cook. JD, I’m sorry to hear about your condition, but glad this diet is helping. It’s incredible what happens to the body when you cut down on sugar and carbs, isn’t it? I guess each cloud has its silver lining. It feels like I will be enjoying this low glycemic diet. This is a different diet, from other diets I’ve known. I really like to eat and this diet just lets me so. Thank you for sharing. Very useful post. Sweet potato are an acting fighting food along with carrots – everyone should eat sweet potato and carrot 3-4 times a week to help their skin problems. Courtney, thanks for sharing. I love sweet potatoes, they’re delicious. Are you still following the slow carb diet? Do you avoid fruit every day except your cheat day? I don’t know if I could cut out fruit from my everyday diet. Suzanne, yes I still follow this diet but not super strictly. There are days when I have lots of meetings or I am travel and I have to cheat. I believe it’s better to make exceptions when you need to than be too strict and cutting everything out at all times – that could be lead to orthorexia and is not good for your skin and health either. If you can’t give up fruit, don’t. Start by giving up refined sugar and have an apple or orange every day as a treat.